Hi, everybody. O episódio de hoje é, of course, sobre a expressão do título. Mas antes de chegar nela eu falo sobre um anúncio que o departamento de transporte colocou no metrô de Londres, que faz um pedido às pessoas que abrem e comem seus lanches do McDonalds dentro do vagão.. hehe. can make others feel quite queasy. Please don’t eat smelly food. So what’s the one on the tube about? Well – take a look at the glossary for this episode, for word meanings. 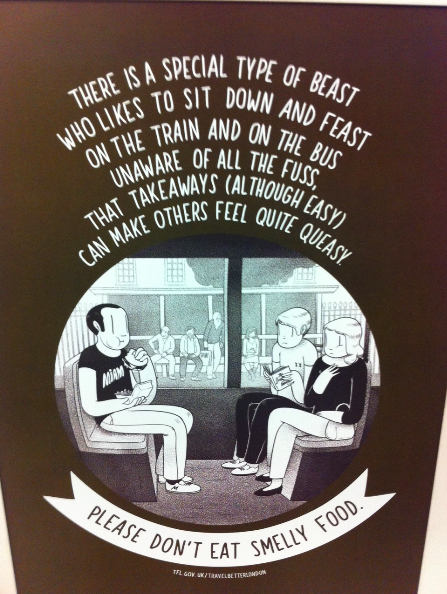 The general message here is, basically… Don’t eat food that smells when you’re riding the tube. Why would they ask you that? Well, it’s a confined space, sometimes there’s no ventilation and the smell gets really strong, and some people are really bothered by it and sometimes they even feel sick. It’s happened to me on the train – a guy eating french fries (or chips, as they’re called here)… Pretty strong smell. I mean, to be honest, on a short ride I personally don’t think that’s a huge problem but that’s because I’m quite the foodie and I like watching food shows on TV even when it’s some kind of food that I don’t like… On the other hand, it’s understandable that some people may feel annoyed by it on their journey back home after a long day’s work. It is a pretty small, confined space and it would actually be really nice to wait and eat your smelly food when you get out of the tube. So I thought it was interesting not only how the government would start a campaign about that, but also that they used verses and rhymes to present it. They’re getting the message across and telling people it’s rude to eat smelly food on the train, but it sounds light-hearted because it’s sort of a humorous poem. Let’s zoom in on one phrase for a minute: “takeaways (although easy) can make others feel quite queasy.” Takeaways (although easy)” – that’s a very useful structure in English. It means that although takeaways are easy, convenient, handy, they may bother other people. So another way of saying “although takeaways are easy” is “takeaways, although easy.” Listen to this one: I just made a lemon pie. The filling, although tasty, was too sweet.” “The filling, although tasty” is a more succint way of saying “Although the filling of the pie was tasty.” So there you go: the filling, although tasty, was too sweet. The movie we watched, although long, was very enjoyable. The hotel, although cheap, was very comfortable. Barry, although young, is a very accomplished lawyer. My dog, although small, is very strong. Care to leave your own example in the comments? I’d like to read it. Talk to you next time. Care to… = Você gostaria de…? what’s the one on the tube about? What does that mean? can be what’s the one on the TRAIN about? This is my example: “I don’t like to be around people who smoke, because it makes me feel queasy, although there are people who don’t bother with it”. Marivan, vc ouviu alguma coisa no meu ‘sotaque’? rsrs. I dont like to be in a small place with someone else eating a smelly food, in brazil there was that yellow cheetos , and that stinks,although it tasted good.. it drives me crazy when im at the hospital and i see all those kids running back and forth , eating junk foods , making the air very unpleasant,and noisy…!! I think we have to avoid eating those kind of foods in a small and public place. Yes, Ricka, I know what you mean. Hi Ana! Interesting post! I’m the one of those people who get queasy when someone eat smelly food around me.And it’s hard because I don’t wanna be the unpleasure person on the bus,so I don’t say anything about it.Take a public tranport is sometimes a bad experience to me. That’s right – we don’t wanna be that person, the one complaining about it, right?? In reality many people would likely support you if you said something. Calling the person who’s doing it would be better than mumbling under my breath (=resmungando pra si mesmo), I think.